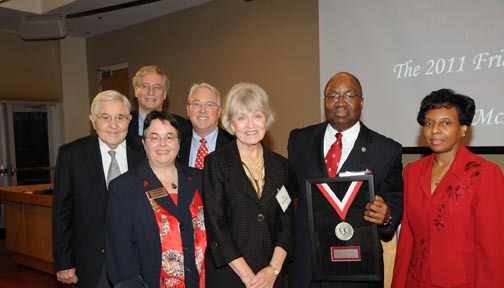 November 18, 2011—North Carolina State University honored Dr. Bill McNeal at the Friday Institute for Educational Innovation’s Friday Medal Presentation on Wednesday, November 17. The Friday Medal is awarded annually to honor significant, distinguished and enduring contributions to education and beyond through advocating innovation, advancing education and imparting inspiration. McNeal has over 30 years of educational experience in Wake County. As Wake County superintendent, McNeal focused all of the school system’s energies on meeting the goal of having 95 percent of third- and eighth-grade students at or above grade level. He helped narrow the achievement gap while continuing to challenge Wake County’s most advanced students. His efforts led to his being named the 2004 National Superintendent of the Year, the only superintendent from North Carolina to ever achieve that title. 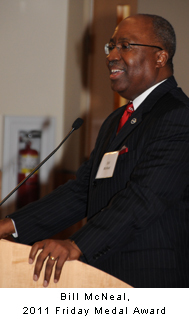 He later served as Executive Director of the North Carolina Association of School Administrators, working to strengthen school and district leadership throughout the State. McNeal also played an integral role in North Carolina’s Race to the Top proposal. He was one of five, including Governor Perdue, to defend successfully the grant in Washington, DC. And he continues to serve NC State by serving on both the College of Education Advisory Board and the National Advisory Board for the Friday Institute. McNeal addressed the group speaking about progress made, and the challenges facing, K-12 education. See video below. Speakers at the event included William Friday, President Emeritus, University of North Carolina; Chancellor Randy Woodson, NC State University; and Jayne Fleener, Dean of the NC State University College of Education. Ann Goodnight from SAS joined Mr. Friday and Dr. Kleiman in presenting the award.